We use the concept of nesting to get wheels to rotate. 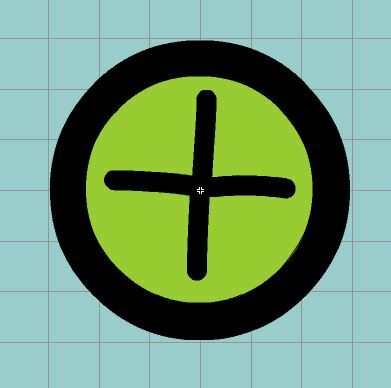 With nesting the rotation is embedded into the symbol. We can do this with photos of wheels or with hand drawn wheels. Either approach works about the same. Here I have chosen to draw the wheel. My stroke is black and my fill is black. I have also gone to view and selected grid. Here I zoomed in. The tool I select is the oval tool (hidden under the rectangle tool). I started on a grid line, I hold down shift to ensure a circle and finish with the circle close to another line. In this case I used a height and width of six units. 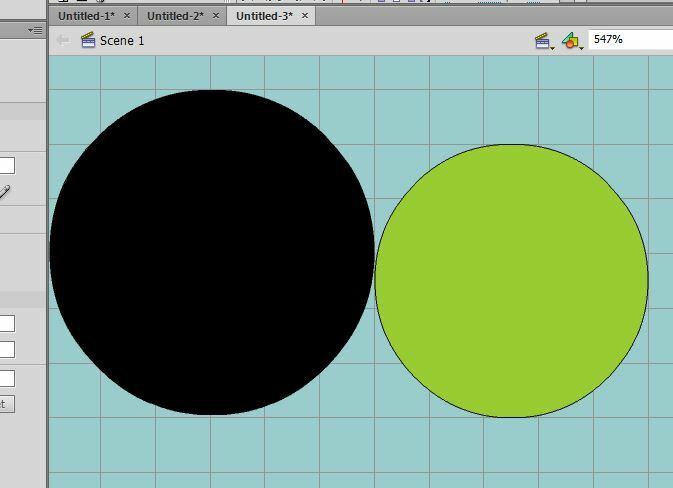 Then I drew a second circle which I made one unit smaller. It has a different fill to distinguish it from the black which will represent the tire. 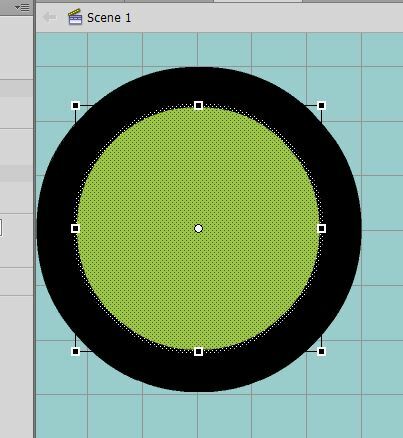 Here I select my second, smaller circle with the free transform tool and drag it over the original black tire circle. I use the midpoint of the sides to help me center the smaller circle into the larger circle. The result is a centered wheel assembly. Here I have drawn spokes using the grid lines as guide points. I edited the line to make it 4 or 5 units wide. I tried very hard to have the spoke intersection in the center of the wheel parts. 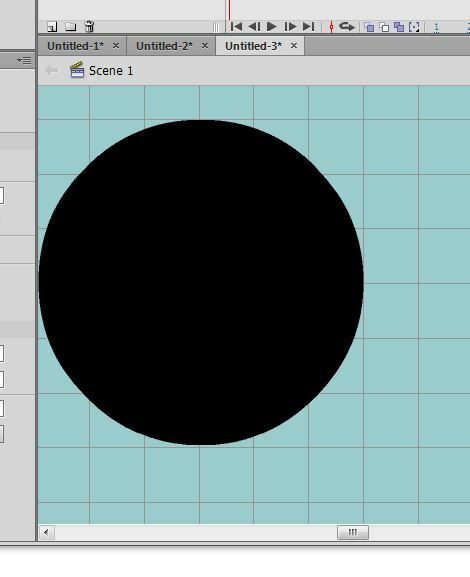 Now I select all of the wheel parts and create a movie symbol called Wheel1. When I do this I want to place the registration point in the very center. Select Wheel 1. Immediately use F8 and convert to a movie clip we will call Wheel 2. 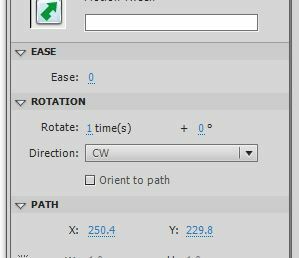 Because we can do a tween of a symbol, we right click on frame 1 and select motion twee, then drag it out to frame 40. Now go to the property manager to select a direction of rotation. The choices are clockwise CW (Car is moving from left to right) or counter clockwise CCW (Car is moving from right to left). You should be able to hit shift + Enter and the wheel will rotate on its own. If you drag the symbol Wheel 1 onto your timeline, that wheel will rotate. Normally you will place it on the top layer so it rotates over the car. I would suggest making the car a symbol as well. Drag in a second instance of wheel 1 and you have both a front and rear wheel. These nested symbols can be placed on one layer. You can also select your car plus the nested symbols and create a symbol car with the wheel rotation built in. This makes it possible to have the car move or do wheelies or flips with the wheels attached and rotating as well.